Why is President Obama going to Israel exactly SIX DAYS before Passover? It is interesting that the real Prince of Peace came to the Passover SIX DAYS early, and told Peter and John to go find a man with a PITCHER OF WATER and then go up to the HIGHEST ROOM (3RD FLOOR) to make the PASSOVER FEAST ROOM READY. Now if one understands the importance of the COSMIC SIGNS, we are being told that the man with the pitcher of water is Aquarius and the highest FLOOR is the THIRD HEAVEN. As Jesus Christ is OUR PASSOVER, it stands to reason that if Obama is pretending to be the world’s PASSOVER, that he would do the same thing, would he not? Is it also telling us when Christ will return for His Bride? Now the Mayan’s claimed that the NEW AGE began 12-21-2012 at 11:11 UT. Were they telling us that the real beginning of the Age of Aquarius began then? That the descent down through a very specific point in the Milky Way ecliptic was in fact a NEW BEGINNING? AN AGE CHANGE? Or perhaps, the BEGINNING OF THE END? And that brings us to the question of why the world’s PRINCE OF PEACE, Obama, was awarded the Nobel Peace Prize when he did nothing whatever to earn it. That was in OSLO, by the way. Was the Prince of This World announcing HIS MAN through his minions that Obama was to be ordained as the PRINCE OF PEACE? As the great peacemaker? And that it was the Oslo Peace Accords that Rabin signed that got him killed at Rabin Square, now called the Sacred Scare by some? If we connect the dots to a very strange inauguration in which Obama placed his hands on two Bibles, one that belonged to Lincoln, and the other to Martin Luther King, both black men, and both assassinated around Easter time. Are we being told something here, or are we just reading something into this THAT IS NOT THERE? Do you remember how Obama mimicked Lincoln by riding the train from Illinois to Washington? How much of what he did was taken from Lincoln? And did you catch the obvious signs that Lincoln presided over a CIVIL WAR, but held the nation together? And do not forget that Lincoln set aside a number of Constitutional safeguards and placed many dissenters in prison for no reason other than that they did not agree with him? Is that why Homeland Security is purchasing 2 billion rounds of ammo? Are we going to see another civil war and uprising? Is that why we have all of these FEMA camps and coffins? Are we watching a STAGED REPLAY FROM THE PAST? And then we have the newly released movie Lincoln, and at the end of the movie Lincoln says he wants to go to Jerusalem. He wants to bring peace to all nations? Are we being told something here? And then we have the Illuminati playing cards that portray two cards of a black man who is being pelted by paint blobs and one shows a HEAD WOUND. 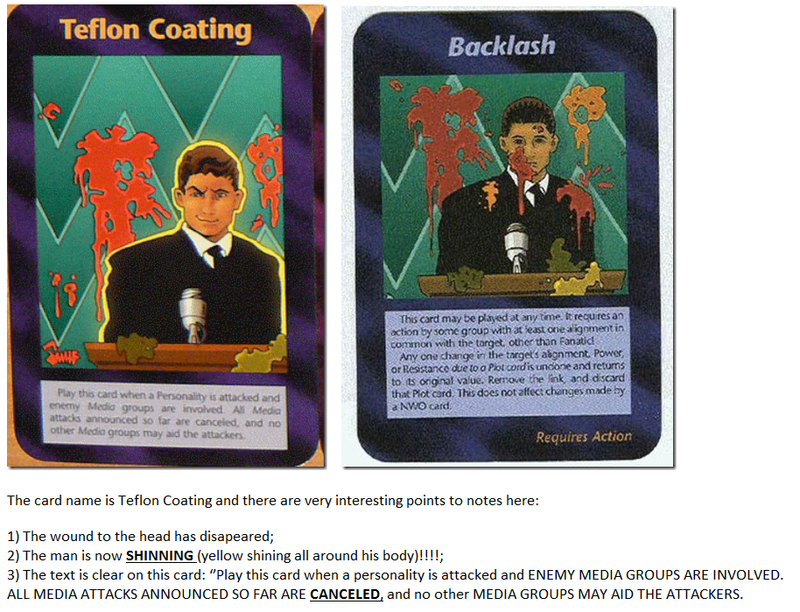 The second card shows a man outlined in LIGHT, that is being portrayed as someone who has survived the head-wound and has resurrected himself to lead the world. And in both of these cards, in the background, are pyramids, and there is a pyramid in Rabin’s Square as well. It is also interesting to say the least, don’t you think? And then we have Obama being presented the highest award by Israel to a man who the leaders of Israel KNOW has betrayed them in the past. Does that make any sense whatever? Now Obama says he is going over there to KICK-START the peace talks (Oslo Accords), and get that restarted. Peace accords from the peace maker? He will be speaking, it is said, at Rabin Square 18 years after Rabin was murdered in cold blood on November 4th, 1995. That’s a 666 and when you tie it all together, it makes one wonder if we are not seeing the stage being set for a fake assassination and resurrection? Anything is possible these days what with Hollywood illusions and who are the masters of deception. And that reminds me of a dream a friend of mine had, in which he was overseas, did not know here, and the President had been assassinated. Does all of this tie together somehow? All of you must remember all of the signs and placards of Obama portraying him as the MESSIAH, the SAVIOR OF THE WORLD. How the crowds all adored him and many fainted. Now remember that the false messiah is a so-called “man of peace” and in the name of peace wages war against all those who he finds as his “enemies”. Is that why he was awarded the Nobel Peace Prize? After all, the Messiah brings peace does He not? Then His mimic would likewise be a ‘man of peace”. Now also remember that Obama is head of the Democratic (Communist) Party, and has the logo of a donkey. So when Obama goes to Jerusalem, he will be riding upon a donkey, another mimic of our Lord. There is a whole lot more about this as well. For example the LOGO for the Obama trip to Jerusalem, the first time ever that we have a LOGO MADE for such a trip. And on that logo in Hebrew it says in the best translations A COVENANT OF PEOPLES. Some claim ALLIANCE OF NATIONS. But the real wording seems to mimic Daniel’s remark about a COVENANT WITH MANY. A PEACE COVENANT WITH MANY. That brings us right back to OSLO and 1993 with Bill Clinton presiding over the famous handshake of the PLO and Israel. 1993 to 2013 is exactly 20 years, and 20 is the number of EXPECTATIONS. What are we then to expect? A COVENANT WITH MANY THAT BRINGS A FAKE PEACE TO THE MIDDLE EAST? Could it be? Is it possible that we will be seeing the long-awaited DANIEL’S 70TH WEEK TO BEGIN? And the Logo also shows the Obama Flag (not American Flag), and the Israeli STAR OF DAVID, the star of PAN, you know SATAN. That then ties us to a NEW COMET, called PANSTARR. Panstarr is a most interesting comet in that it will be at its closest on March 10th, exactly 1.109 AU, or another 911. We could also call it LUCIFER”S STAR, THE BRIGHT AND MORNING STAR. And then we have Comet ISON, that just came by Jupiter, the KING OF PLANETS, and it suddenly flared up as Obama was sworn in for his second term. And by the way, Lincoln was assassinated on Good Friday not long after he was sworn in for his SECOND TERM. Seems odd that Comet I SON, YOU KNOW ‘I am the Son”, or we could say THE ONE, or as Senator McCain said of Obama THAT ONE, will come to its closest approach on November 29th, 2013. November 29th 1947 was when the UN issued the division of Palestine for the Nation of Israel. Then on November 29th, 2012, the UN declared that Israel’s bitterest enemy the PLO was now a recognized STATE. And in that meeting, EVERYONE OF THE LEADERS, AND ALL THOSE PRESENT who spoke USED THE PHRASE “PEACE AND SECURITY”. And Obama said in one of his speeches about all of this used the term “PEACE AND SECURITY”. And so did the Pope. Are we being told something here? Is it possible that all of these are just coincidences? So then what does November 29th, 2013 hold for all of us? Is sudden destruction just around the corner? And not only has the Pope called for a NEW WORLD ORDER run out of the United Nations, he has also declared publicly that THERE IS NO SECOND COMING OF CHRIST, there are no such things as END OF DAYS. That is the height of APOSTASY, and a public declaration of APOSTASY. He is not the only one, it is spreading rapidly throughout the Church. “Where is the promise of His coming?”. These people are willfully ignorant and defy many passages of Scripture to declare that the Lord IS coming back to fulfill his RETURN COVENANT. So much here it defies coincidence. And do you remember when Obama signed a “Covenant with Israel” on the 9th of Av, 2012? And the 9th of AV is a very, very bad day for Israel. And then speaking about the Pope, and his resignation on February 11, 2013 to be effective February 28th, 2013, we need to understand why the Lord struck ST.PETER’S Basilica, in ROME on the same day TWICE. It has to do with the prophecies of the Popes. Has the Lord Himself NAMED THE NEXT POPE? According to the prophecies, the next and final Pope is called “Peter the Roman”. I believe that no matter who they install as the final Pope, that the Lord has already named him Peter the Roman. 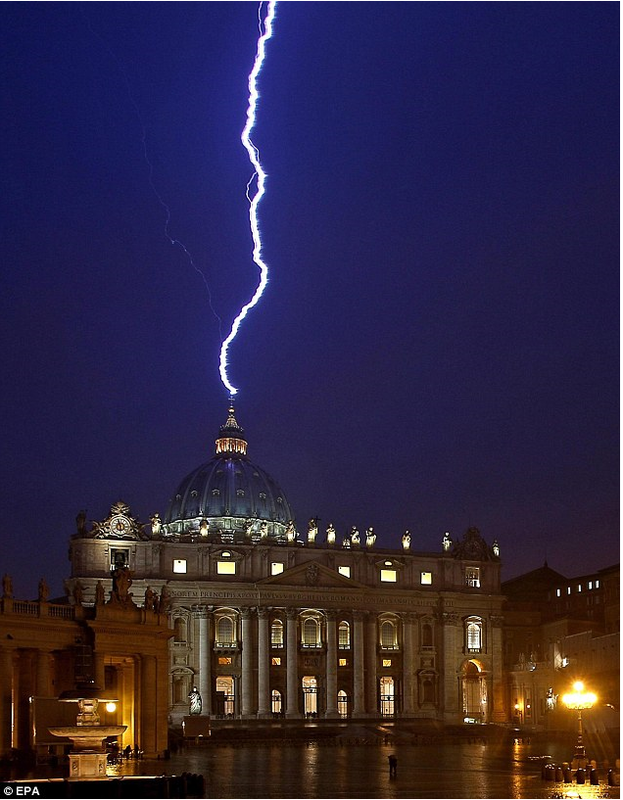 The lightning stuck St. Peter’s Basilica in ROME. Hence PETER THE ROMAN. We are nearing something of momentous importance to the Christians and the world. Remember that much of prophecy is fulfilled COVERTLY, but at the same time, RIGHT OUT IN THE OPEN. But it is seen and understood only by those who are really watching, and remember that Jesus told us all to WATCH. If you are really watching, then the Lord will place in your path those other brothers and sisters in the Lord who have expertise in these areas who will warn you, inform you. Most of this has come from a brother in the Lord who lives in Canada. He is making a video about all of this and when he has in done, I will post it. I take no credit for the above. But I do know that all that is being pointed out is more than just a series of coincidences. Like I said at the beginning, there is something going on here, but what it is ain’t exactly clear!! YET. Did some research and found out Lincoln’s mother was white ( a plantations owners wife) and was having a long time affair with one of the slaves on the plantation and when she became pregnant she tricked her husband into believing baby Abe was his. Oh my goodness, you have put into words what I have been feeling and sensing about this March. Thanks. I read the full text of the Pope’s speech translated and I did not see where he said Jesus will not come but then he did not say Jesus will come. Do you have a link where the Pope states that? I just want to add to my previous comment that the Emblem of Israel which we call Magen David (shield of David)and is known as the Star of David has nothing to do with Satan or Pan. This is absolute nonsense. Cults will copy originals but this does not equate with their falsehoods ! There are meaningful symbols hidden within this emblem pertaining to the Jewish world. All very possible BUT I would say to you that depicting ISRAEL’ S FLAG with the STAR of DAVID shown here is wrong. Actually the ‘star’ was originally called in Hebrew MAGEN meaning SHIELD . The ‘star’ used on Israel’s flag has 12 lines depicting the 12 tribes of ISRAEL AND it also contains the 22 letters of the Hebrew Alef Bet which you cannot see clearly in this ‘block pattern’ of this star shown on this logo..SUITABLE FOR THE FALSE MESSIAH ! This is a totally false diagram of Israel’s Magen David . It is well known that the six pointed star is occult to the core – and if what you are saying is correct, then why does the Lord Himself condemn it? Israel right now is run by the occult (Illuminati), has no spiritual fruit whatsoever, and must now go through the time of Jacob’s trouble. Again, study to show yourself approved. WOW! Stewart, I hope when the person that did this gets it in video form for you that we will be able to get a copy I have a relative that seems ro get visuals but not written. The St. Malachy prophecy is generally thought of as a hoax in the Catholic Church. Numerous Catholic bloggers have written recently on this. The National Catholic Register likely has many writings on this subject. The article here is interesting, but I think we all have to be careful not to read too much into what may or may not be signs; afterall, only God knows, and I think we can all agree on that. What we believe to be ‘signs’ may or may not be–they could mean something or nothing at all. I hadn’t heard the Pope say anything about a New World Order. The Catholic Church is considered the biggest barrier to socialism/communism, so I don’t see how this could make sense. Neither have I heard the Holy Father say anything about there not being a Second Coming of Christ. Obviously, the Catholic Church teaches there will be a Second Coming, but “we know neither the day nor the hour”–no one does. It could come now or in centuries. There is, however, a common belief that while this may not be the end of the world, it could be the end of this age. I think there is a distinct difference to be drawn. Perhaps this is what the Holy Father is really saying. As for the lightning strikes–who knows?? From what I understand, lightning often strikes there. Whether we agree or disagree, I’m sure most of us are praying about our future. God bless. Obviously you need to do a lot more research than you have – the Pope has in fact called for New World Order many, many times, and said it should be run by the United Nations. He just recently said in a speech that there was no second coming and no end of the age, because their view of prophecy is wholly different than the Protestant viewpoint and in fact the Biblical viewpoint – if the Malachy prophecy is untrue, then it is strange it is all being fulfilled. It is like the Protocols, The Iron Mountain Report, and other documents that are all coming true, but somehow they are all false. Time will tell as it always does. It seems that very few really do understand the times we are in and are in denial, therefore the “signs” are not really signs at all, and no one should be concerned. Study to show yourself approved. But really–as you said, only time will tell. We can make lots of guesses and have lots of hunches–but who really knows? That’s the point I’m making. It can be easy to read into whatever is going on. I DO believe ‘something’ is going on; but I think we have to wait for it to unfold. I think the best we can all do is to live the best lives we can and get close to the Lord. He will always care for us. I do think some things are being interpreted differently by different people, from the readings I have done..
We really won’t know it’s the end until the Lord clearly appears and shows us, despite any ‘studying’ one might choose to do. I guess the bottom line is: We have to wait and see. God bless. Of course the prophecy of the Popes is “officially” labeled a hoax by the RCC. But it would be very naive to take their word for it when their ACTIONS say something entirely different. In fact, there was even a pope last century that named a book he wrote the exact label given to him by St.Malachy. I forget which pope off the top of my head but anyone can do a quick search and verify. There are all kinds of examples of popes seemingly going out of their way to fulfill the prophecy via the name they choose after being elected, also. And the Star of David is obviously a pagan symbol and an abomination to God. It baffles my mind how people refuse to see the truth these days. I have strong suspicions that the vision will no longer tarry, but will surely come to pass! and many though be told will not believe. John 12, verse 1 ? days before passover…and in Verse 14, he was on a donkey. God bless you. replace ? by 6 (days) in my previous answer, i made a mistake typing the ”6”. I’m with you . I do think he is “the one”. I always have! Excellent article! You really connected the dots. God bless you and yours. Awesome Stew, thanks for continuing to feed the flock! Everything is screaming more and more that Jesus is at the door. Even so, come, Lord Jesus!! I honestly believe there are FEW who think about anything but their next $, & how to spend more…..I also wish people understood THIS IS REAL, not pretend for children, this is SERIOUS, not a laughing matter & get prepared for what we WILL be dealing with. Thank you for sharing the insight you have with us all, & God bless you! Linclon was black? I am not sure I understand this statement. Could you please explain? Yes, Lincoln had a large amount of black in him, most people are not aware of it, but it is true. Special ! Thanks for explaining all of that. It seems so very probable to be sure. May we all remain strong in the Lord Jesus Christ as dark days get oh so much darker !